Family-Friendly New Year's Eve Events Near Washington, D.C.
Guide to a Family-Friendly New Year's Eve in Washington, D.C. If you're traveling to the Capital Region with your children to celebrate the new year, there are plenty of family-friendly events happening in Washington, D.C., Maryland, and Virginia this December and January. Whether you're looking for a great place to view fireworks or want to enjoy kid-appropriate games, music, and activities with your family, these events provide something for all ages. From First Night festivals in the Maryland and Virginia suburbs to a daytime brunch cruise along the Potomac River, there are plenty of ways to celebrate New Year's Eve in the Capital Region. Based on the "First Night" concept of celebrating the past year of a community, the City of Annapolis, Maryland, brings the entire city together for a New Year's Eve celebration on the last day of December. Festivities start at 3 p.m. with a family-friendly day of activities hosted by the City of Annapolis, including face painting, an obstacle course, moon bounces, and an on-site fireworks display to end the event. Families can then go to nearby restaurants for New Year's dinner, put the kids to bed, and return to Susan Campbell Park at City Dock for dancing and live music starting at 8 p.m. At midnight, a huge firework spectacular will take place over Annapolis Harbor to ring in the new year and end the celebration. Although the outdoor rides at Adventure Park USA in Monrovia, Maryland, will have shut down for the season by the first of November, you can still enjoy all the indoor attractions on the last day of the year followed by a Family New Year's Eve Party from 9 p.m. on December 31, 2018, to 12:30 a.m. on January 1, 2019. This family-friendly event features finger foods and drinks (non-alcoholic), kids' games, live music and dancing, and access to all of the indoor attractions at Adventure Park USA. Purchase tickets in advance to save money on admission. Although the popular Symphony of Lights drive-through Christmas light attraction in Columbia, Maryland, officially closes for the holiday season on December 30, 2018, the park will be open one extra night this year to celebrate the New Year early. On December 31, 2018, from 3 to 7 p.m., the Midnight at 7 celebration welcomes guests to walk through the grounds of the Merriweather Post Pavilion for a day of family fun. Presented by the Howard County General Hospital, Midnight at 7 features live entertainment, dancing, and other exciting activities appropriate for all ages and a small fireworks display that will take place at 7 p.m. to end the event. First Night Alexandria is one of the largest family-friendly New Year's Eve events in the Capital Region, featuring over 100 live performances and plenty of local cuisines, culture, and art to sample and see during a full day of fun. Taking place at various venues in Alexandria, Virginia, from noon to midnight on December 31, 2018, First Night Alexandria has something for the entire family. During the event, musical performances will be held inside Old Town Alexandria’s historic buildings and many activities will also take place at the Masonic Temple on Callahan Drive. At Midnight, you can celebrate the New Year while watching the beautiful fireworks display over the Potomac River. Famous for its post-race pizza party, the Fairfax Four Miler celebrates its 10th year on December 31, 2018, starting at 6 p.m. The race will start and end at the Pacers Fairfax at the corner of University Drive and North Avenue and run through the rolling hills of Old Town, Fairfax, and George Mason University. The post-race pizza and New Year's Eve party will take place in the Old Town Hall. Advanced registration is required to secure a spot at the pizza party (and your own branded sweatshirt from the event), and prices for registration increase on December 1 and 27, 2018. Proceeds from the event support the Fairfax Police Youth Club. Free and fun for the whole family, Watch Night in the City of Falls Church, Virginia, is the biggest event of the year for this small community. The 21st annual Watch Night starts at 7 p.m. on December 31, 2018, and will conclude just after midnight on January 1, 2019. Taking place on four blocks of West Broad Street, Watch Night will feature live performances by various musicians, a scavenger hunt, historical reenactments by the Victorian Society of Falls Church, special menus at area restaurants, obstacle courses, firepits, and free noisemakers for the countdown. The evening concludes with a New Year’s countdown and lowering of the historic star that first lit the Falls Church sky in 1948—the year Falls Church became an independent city. Like many First Night events across the country, First Night Winchester brings the community together for an evening of entertainment, art, and culture. With multiple stages around the city featuring live entertainment including performances of folk, jazz, bluegrass, oldies, puppet shows, and kids' programs, First Night Winchester offers something for the whole family on New Year's Eve. Performances this year include the 92.5 WINC FM Dance Party, Acoustic Soul, the Battle of the Buskers at the Old Town Walking Mall, and Louie Foxx at the First Presbyterian Church. Additionally, local restaurants will be open and offering discounts as part of the First Taste of Winchester event that coincides with First Night. At midnight, participants can ring in the New Year with the official “Apple Drop” and midnight fireworks display. If you're looking for somewhere to celebrate the new year early in the Capital Region, you can head out to the Fredericksburg Fairgrounds in Fredericksburg, Virginia, for the annual Downtown 31 event, which takes place on December 31, 2018, from 6 to 9 p.m. Featuring a variety of musical performances at indoor stages as well as a host of family activities, this annual event is perfect for families with an early bedtime. The big countdown to the new year takes place at 9 p.m. and ends with a ping pong ball drop the kids will certainly enjoy. On New Year's Eve, the Bull Run Festival of Lights and Holiday Village will be open for a special event to celebrate the coming year. Featuring rides, refreshments, and last-minute pictures with Santa Claus, the New Year's celebration will also be your last chance of the year to enjoy the carnival inside the Holiday Village. The Bull Run Festival of Lights is a popular drive-through Christmas lights attraction in Centreville, Virginia, that will be open seven nights a week from Thanksgiving 2018 to January 6, 2019. With over two and a half miles of lights strung up in Bull Run Regional Park, the Festival of Lights is great for kids any time of the holiday season, but the Holiday Village is only open on select nights, including New Year's Eve. The Festival of Lights drive-through attraction, the Holiday Village, and the Carnival all require separate admission. After the fireworks take over the night sky in Alexandria, Virginia, you can return to Washington, D.C. and embark on a daytime cruise aboard the Odyssey Cruiseline's New Year's Day Bottomless Mimosa Brunch cruise. 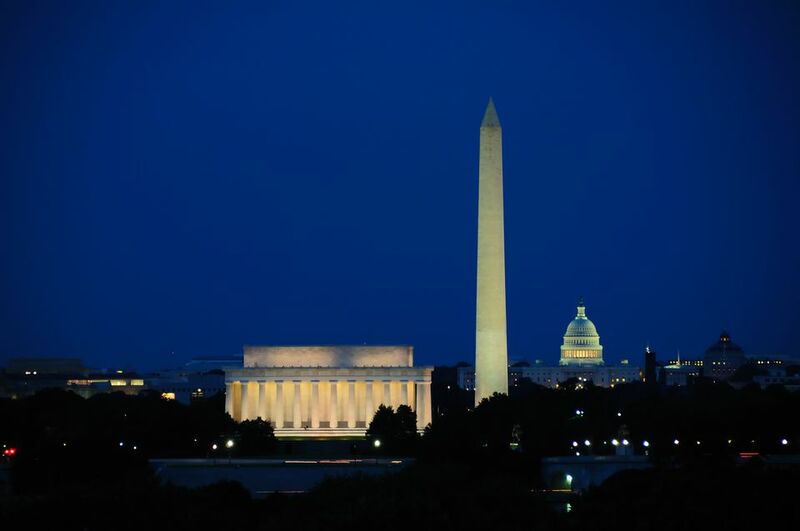 Featuring live bands performing festive holiday hits and jazz standards, this two-hour cruise gives the whole family access to unparalleled views of historic sites around the Capital, including the Washington Monument, Lincoln Memorial, and Capitol Building. The brunch buffet menu includes seasonal fruits, breakfast pastries, meats, and potatoes, smoked salmon, scrambled eggs, a build-your-own Belgian waffle station, and a variety of lunchtime selections and desserts.